Tangerine Quartz is identified as a quartz point, mass or cluster that is stained with a Hematite (Iron Oxide) film or coating. This stain is on the outside of the crystal and can be removed when cleaned in an acid bath. Polishing or tumbling can also remove the color. 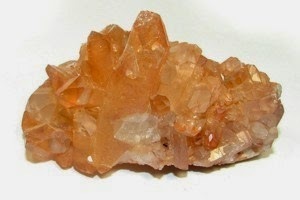 Tangerine Quartz can range in hues from pale yellow to deep rust. A wrapped Tangerine Quartz Pendant or point would be a wonderful piece to use when you feel pulled in to a situation that is filled with chaos or drama. It will give you the strength necessary to step out of this dense energy, as it raises your frequency to a more positive vibration, making your interactions with others more enjoyable and productive. Had a difficult day? Place a Tangerine Quartz point at each outside corner of your bathtub with the points facing towards the center. This mini grid will allow for the release of tension and stress built up during the day. It will also ground and calm the chatter of the mind, allowing the “What if’s” and “I should have’s” to gently melt away. This same formation can be used in meditation as well. Simply sit as you would in meditation and place each point facing towards you-one in front, one in back, one on either side. 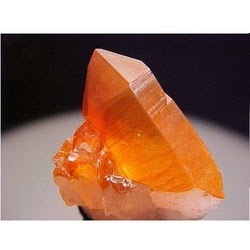 The energy of Tangerine Quartz is amazingly subtle, smooth and highly effective. Author Michael Gienger - Healing Crystals As I love the crystal and keep the many collections of crystals book.